Travel along with Field Museum scientist Dr. Corine Vriesendorp as she and her team conduct a Rapid Inventory of the Cuyabeno-Güeppí region where Ecuador, Peru, and Colombia meet. 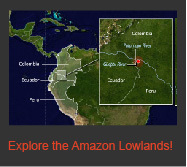 Through this interactive map, you can explore their field sites, check out the plants and animals they found, learn more traditional resource-management techniques of indigenous peoples, and discover how Rapid Inventories help conserve Amazonia's lowlands. During their Rapid Inventory, Dr. Vriesendorp and her team filmed a series of Video Reports and Journals. You can view these videos individually below, or you can visit The Field Museum's YouTube Channel to see all our Expeditions videos. To view Dr. Vriesendorps' videos in high-definition, you can also visit our Expeditions Channel on Vimeo.